Conferences take place across the world. 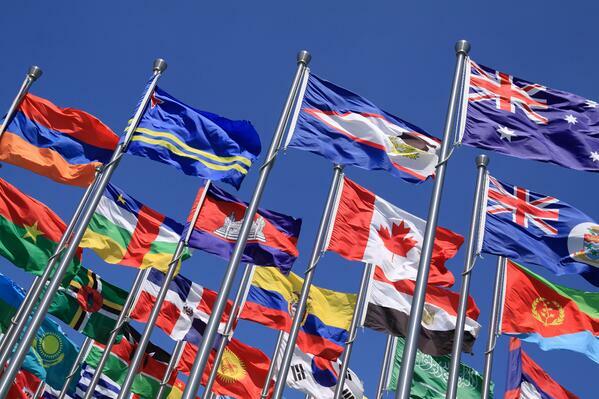 During a conference, participants must employ a variety of communication and critical thinking skills in order to represent the policies of their country. 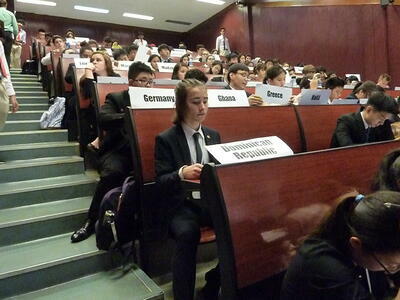 Brillantmont participates in several MUN conferences each year, locally and overseas. Everyone in the Brillantmont community has the opportunity to attend a prestigious MUN conference. 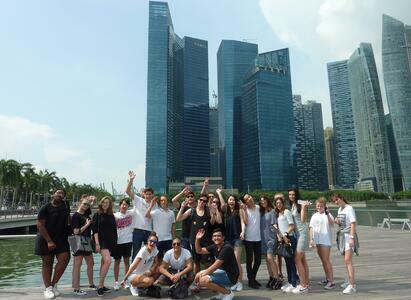 In fact, every year around 40% of our students attend Model United Nations and amazingly, Brillantmont is the only school from Europe which participates in MUN Singapore. The MUN conference in The Hague is hugely popular, which means that bigger schools can only take a small percentage of their students who wish to attend. However, Brillantmont is proud to be an inclusive school, which means we can take every student who wishes to experience an MUN conference. Inclusiveness and providing opportunities for all, means that at Brillantmont the focus of MUN is on learning and development, not competition, performance and elitism. 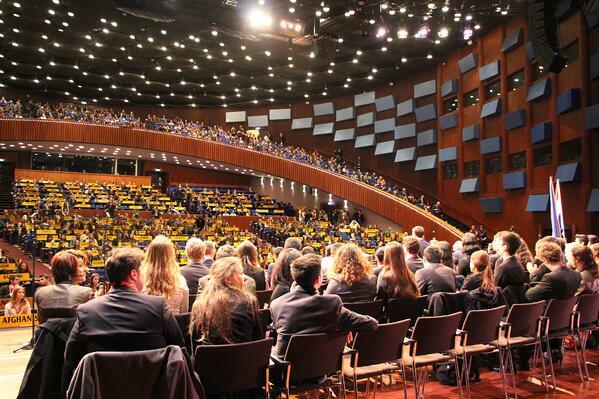 Through the conference experiences Brillantmont’s students get to grow and develop. Having their personal achievements celebrated breeds confidence. Any anxiety, apprehension and self-doubt with regards to public speaking, levels of English when preparing for the challenge of the first MUN conference is replaced by ambition, confidence and desire to engage in public debate. MUN is a unique course. It is academically challenging which explains why it is held in high regard by admissions departments for College. It is also recognised as a High School credit in our Diploma program. As well as developing an international perspective, boosting academic English vocabulary and nurturing informed global citizens, MUN teaches students about themselves. The authentic learning experience provides them with the opportunity to take control of and responsibility for their learning. Dealing with uncertainty, collaborating with others, leading, managing and team building are all developed in the conference, together with emotional intelligence and public speaking. The practical real life situations cannot be manufactured in the classroom; building a team in a room of over 100 people you do not know is simply not possible. All this is in a safe environment of safe failure. Students are encouraged to take risks, to learn through trial and error without the negative consequence of a bad grade or lost opportunity. In the future they can draw on this experience and the confidence it installed. Our first MUN conference of the academic year took place in early November and was held locally. 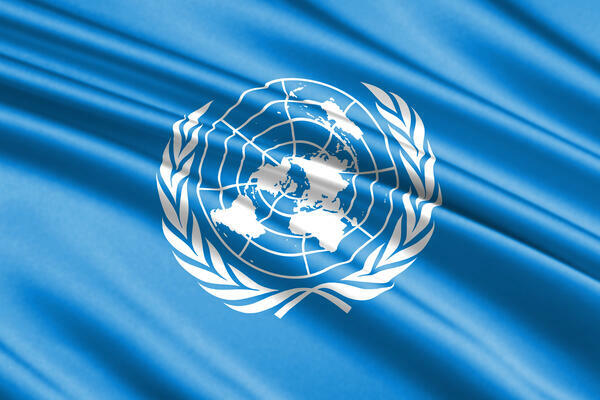 Students with no MUN experience were able to sample a simulation of the work of the United Nations. MUN Singapore – here we come! Who couldn’t love Singapore with its food, architecture, shopping and vibrant lifestyle? But what makes MUN Singapore so special and important is the visible student development that the students themselves see and feel for themselves.